Having been a key member of research teams that announced discovery of the world’s smallest primate fossil in 2000 and the oldest primate skeleton in 2013, Northern Illinois University Professor Dan Gebo has made more than his share of headlines worldwide. He also has won every award that NIU has to offer for great teaching and research. Now Gebo, an Elgin resident who holds a joint appointment in anthropology and biological sciences, is being recognized at the state and national levels. The Carnegie Foundation for the Advancement of Teaching and the Council for Advancement and Support of Education have named Gebo as the 2014 Illinois Professor of the Year. The announcement is being made today (Nov. 20) during an awards luncheon at the National Press Club in Washington, D.C.
“In pursuit of proof for the concept that great researchers often make great teachers, one would be hard-pressed to find a better example than Professor Gebo,” NIU President Doug Baker said. A comparative anatomist and paleontologist, Gebo specializes in the evolution of monkeys, apes, humans and lower primates. 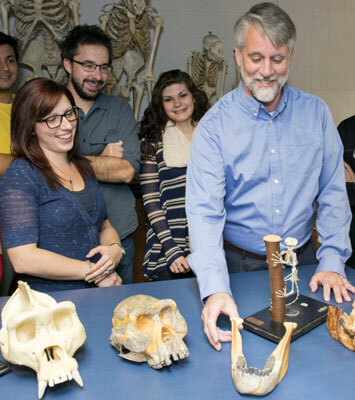 He teaches introductory physical anthropology and a wide range of courses in primate and human anatomy and evolution. Over the course of his 27-year career at NIU, nearly 7,000 students have taken his classes. “A teacher needs to be part counselor and part mentor to ensure that students develop their full potential as questioners and knowers,” Gebo says. “I am committed to hands-on learning, and I bring bones, casts, pictures, data tables and other types of evidence to help students understand concepts – or to explain how these concepts are challenged and reformulated within the field. As an undergraduate, Eric Sargis was planning a business career. Then he took an introductory course taught by Gebo, switched majors, took more of Gebo’s classes and published a research paper with his mentor. Today, Sargis is a professor of anthropology at Yale University. Lambert stayed at NIU to work on her master’s degree. Gebo served as her thesis adviser and also selected Lambert to work as a field research assistant in Uganda for a project he was conducting on wild monkeys. Lambert is now a distinguished professor of anthropology at the University of Texas at San Antonio. She continues to work in primate biology and conservation in Africa. Gebo’s efforts also benefit students outside biology and anthropology. He helped spearhead NIU’s USOAR program – for Undergraduate Special Opportunities in Artistry and Research. It has provided more than 100 undergraduates from all disciplines with funding for research, including in China, Peru, Ireland and Cuba. He also oversees the annual awarding of 16 four-year undergraduate scholarships in his role as director of the Faculty Fund. 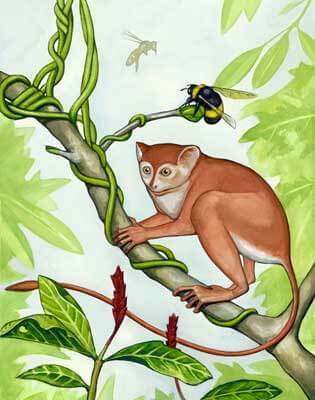 Several years ago, Mat Severson was working toward a degree in illustration at NIU when he was introduced to Gebo, who needed original artwork for his primate research. Gebo hired Severson to work on several projects. “At first I created some simple illustrations to go along with articles he had written, but over time the projects just kept getting larger,” Severson says. “We worked to create a reconstruction image of a 55-million-year-old primate. We also completed a textbook on primate comparative anatomy. Gebo’s research has shed light on how limbs and bodies adapt over time, with a particular focus on the evolution of foot anatomy and locomotion. In his laboratory, visitors will find the tools of his trade on display, including skeletons of lemurs, chimpanzees, gorillas and humans. But it’s the smallest treasures in his collection that most intrigue the professor. 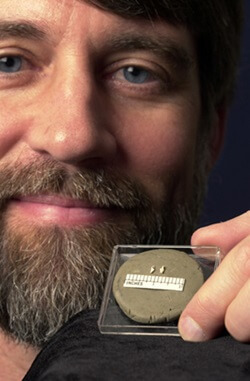 Dan Gebo in 2000 when he and colleagues announced the startling find of 45 million-year-old anklebones, each the size of a grain of rice, belonging to separate thumb-length primates. Stored away like precious gems are dozens of fossils of tiny primates, including foot bones the size of a grain of rice. Through his field work and published articles, Gebo has made a compelling and controversial case that the earliest primates were tiny animals, so small they were the prey of owls. Not surprising, his research grabs media attention, including in 2000 when he led a team that discovered the fossils of 45-million-year-old, thumb-length primates in China that represent the origin of all monkeys, apes and humans. The find made the front page of the New York Times, Washington Post and newspapers worldwide. Recent work in China has further illuminated primate origins dating back 60 million years. Gebo also has conducted fieldwork in such places as Colombia, Costa Rica, Egypt and Madagascar. He has authored or co-authored nearly 80 publications in top-tier professional journals, including Nature and Science. 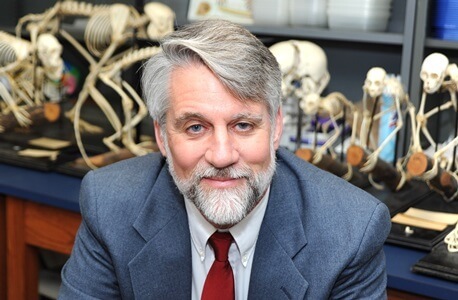 “Dan is at the cutting edge of the discipline of physical anthropology and is a key protagonist in a number of important and ongoing theoretical debates,” NIU anthropology professor Michael Kolb says.